Yesterday was my first running event of the year. 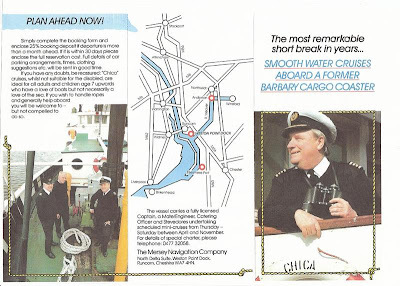 We’d originally planned to journey to Liverpool by boat on the Leeds and Liverpool, arriving in the docks via the new Liverpool Link. This terminates in Salthouse Dock, only a stone’s throw from the start of the race. But, alas, it was not to be. BW don’t take bookings for the link till after Easter. So we hired an Astra from Enterprise and made the trip by road instead. Certainly quicker, but not as interesting. 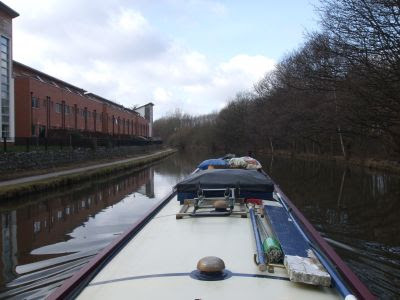 We’ve booked passage for later in the year now, after a visit to Manchester. 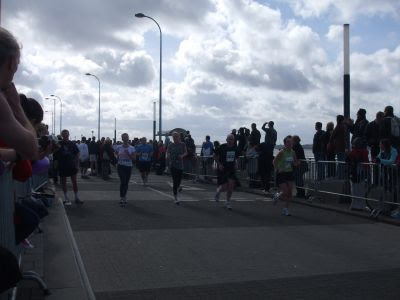 The Liverpool half-marathon is a circular route, for the second year the start and finish lines are alongside the Mersey estuary. 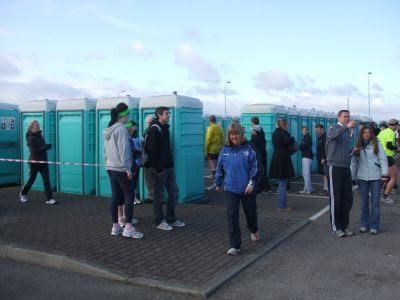 It was cold waiting for the gun, but with 5,500 entrants we could at least huddle together! 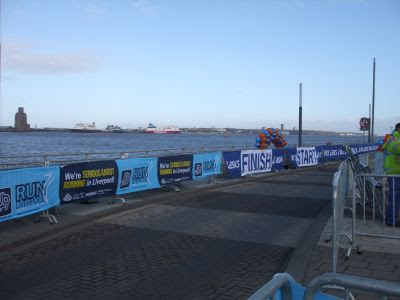 Half an hour before the gun, the wind swept start line was empty. But the Porta-Loos were getting full! I didn’t have a good run, but frankly didn’t expect to. Six weeks ago I tore a muscle in my thigh and it hasn’t mended completely. I was in two minds whether to run or not, the injury not yet fully healed and big gaps in my training programme. But I thought I’d have a go. The Neurofen tablets lasted till mile 9, and from then on it was gritted teeth and a slower pace to the end. The last 3½ miles into the headwind coming down river didn’t help either. Still, I finished, in a rather pedestrian time of 1:54. Hobbling around like an old man today, though. I was placed in the first half of the field, so didn’t do so badly. It took us 40 minutes to get back out of the carpark, then another 45 to get back to the boat. After a shower I still managed to watch the last half of the Australian GP, pleased to see Button cruise home to an easy win. Shame about Hamilton, there would have been words in the pits, I’m sure, following an apparently unnecessary pit-stop. We had intended to move on this afternoon, after taking the car back, but the weather was a bit grim and I am still a bit sore, so we’re leaving it till tomorrow. Not sure where we’ll finish up, though. We’ve made a couple of short hops from Longacre Wood of the last couple of days. 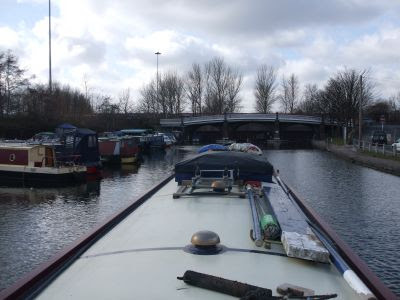 First to near Bridge 206 on Wednesday, then today to Barnton Bridge. 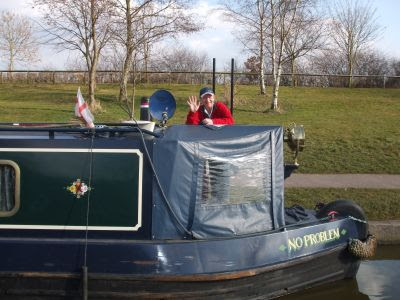 Meg and I had a pleasant circular walk along the canal and river on Wednesday morning, and picked up another travelling companion on route. She stayed with us for about a mile, and I was about to turn back to find where she was from when she stopped, then turned and headed home herself. 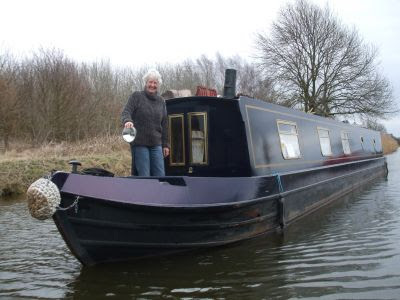 She must be local and familiar with the area.We joined the river near Dutton Lock. I always feel obliged to take a picture of the remains of MV Chica as I go past. Maybe to catch a glimpse of the shade of Tom Barlow, the last master, in the wheelhouse? 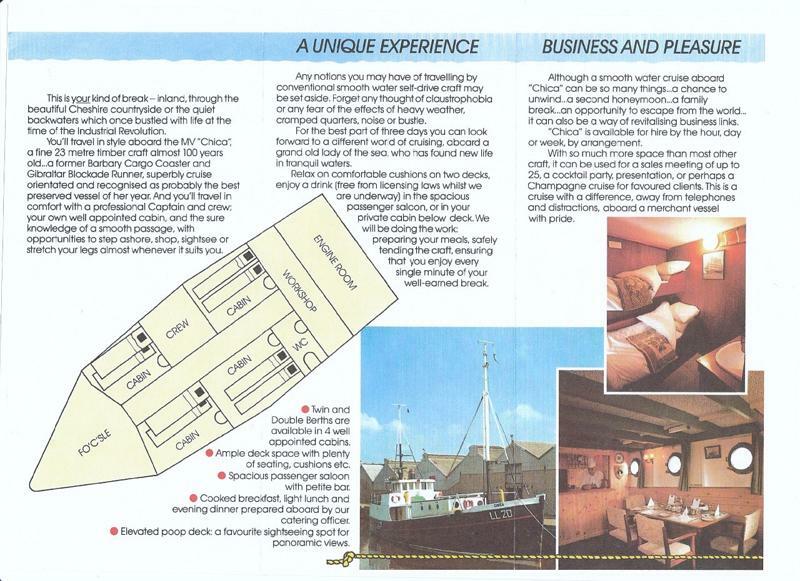 I’ve been contacted by Andy Coles, the son in law of the late Captain Barlow, and he’s kindly provided lots of details about Chica’s history, as well as some documents. 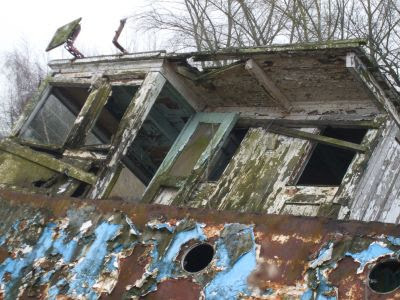 From her beginnings in 1894 as a sailing cargo vessel carrying salt fish along the Norwegian coast, to running contraband on the North West coast of Africa, finally coming to rest on the muddy bottom of the River Weaver, she’d certainly had a varied life. It’s a shame she foundered just a year before her 100th birthday.She arrived in the warmer waters of the Mediterranean in the middle of the 1970’s, and traded general cargo as far south as Casablanca and Angola. It was off Angola that she was involved in blockade running for the Angolan rebels during civil war. Not arms though, something much more important to West African insurgents, Cocoa-Cola! Having been originally named “Flora”, then variously “Bjorg Haukas” and “Lill Tove” she received her final name in 1981. Reports suggest that she was operating on the fringes of the law at this time. In 1983 she arrived in the UK, and was laid up for a while at Mostyn in North Wales on the Dee estuary before trading on the Mersey and the Manchester Ship Canal. She ended her days as a passenger cruise boat on the Weaver. 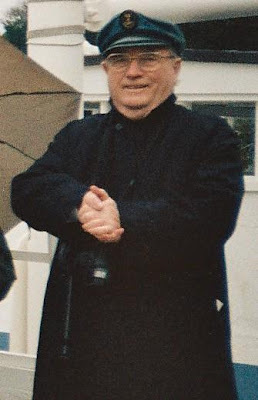 Captain Tom Barlow. 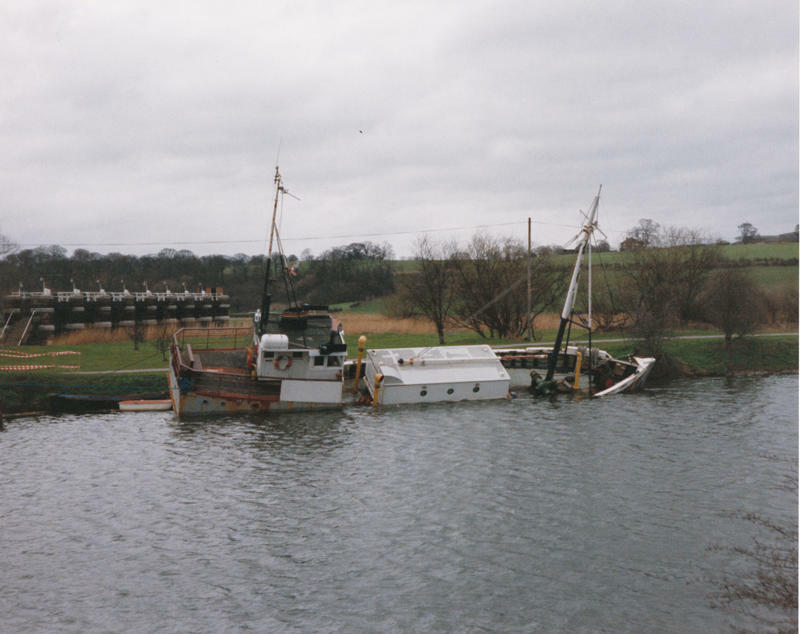 Courtesy Andy Coles When she sank in 1993 BW made extensive investigations into her ownership to try to get the wreck removed, but was unable to get a definitive answer as to where the responsibility for her actually lay. There was also some doubt as to whether she was even insured at the time of the sinking. The estimated salvage cost could not be raised, and so nor was the Chica. So there she rests, quietly rotting away, on the bottom near Dutton Lock. 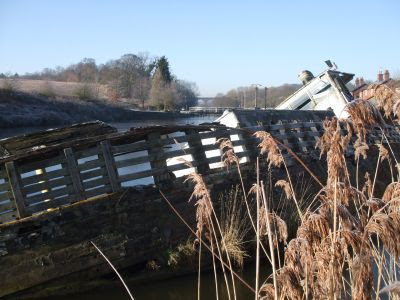 On the subject of wrecks, there’s a rather smaller but more obstructive one on the canal near Saltersford Tunnel. 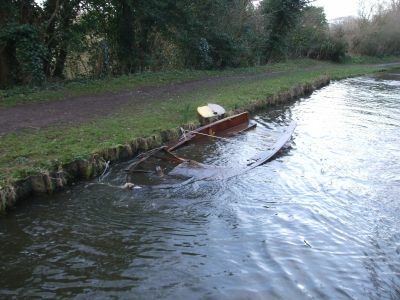 Cracklyn, an 8’ sailing dinghy, was moored on the offside near Little Leigh Pond, but has gravitated to the towpath side, and with the transom knocked off, is awash to the gunwhales. It’s only a matter of time before it gets run over by a passing boat, I just hope it’s a steel narrowboat and not a fibreclass cruiser. Time for a move today. Essential supplies (bread, milk, whisky) getting low, as was the water tank. The loo tanks were going in the opposite direction. 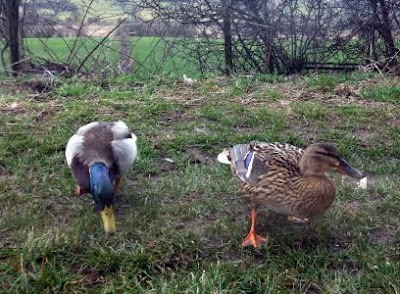 Ducks visiting for breakfast We’ve had some changeable weather the last few days, some heavy rain and some fine spells. 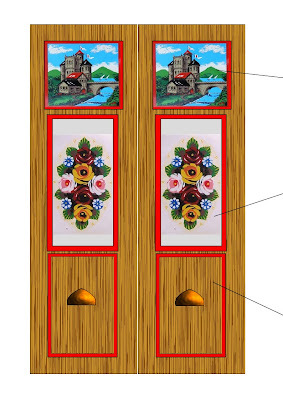 With it being unsettled I’ve not been able to make much progress on the door liners, but here’s the design I’m aiming for…. Door liners design We had a boat draw up behind us for one day, Dave and Carole on NB Freedom. A pleasant couple, they’ve been afloat for around 2½ years. Library and phone numbers were swapped. They moved on, up towards Manchester, yesterday. Today dawned a bit grey and blowey but dry. We got away at 10:15, timed to arrive at Preston Brook Tunnel to catch the 11:00 entry window. A stop before Preston Brook Bridge for an hour for Meg and I to toddle off up to the Spar shop sorted out the food supplies, then a left turn took us to the services on the Runcorn Arm to deal with the domestic situation. We didn’t time it quite as well on the way back to the tunnel, and had a 30 minute wait before we could go in. I took the opportunity to have my daily dose of “Dr Kawashima’s Brain Training” on Mags’ DS Lite. I’ve got a “brain age” of 36, according to the good doctor….. I just wish the rest of me matched! 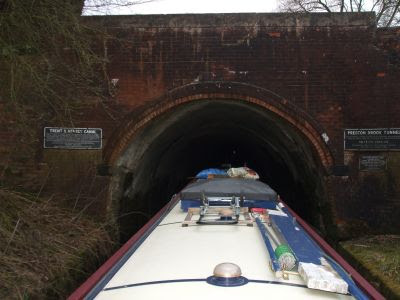 Another boat had arrived while we were waiting, and they went in first, taking it very gently through the tunnel. We caught them up at the stop lock, and I went for a chat. Turns out that they bought the boat new, on the Bridgewater, last October, but this is the first foray onto BW waters. And Dutton Stop Lock was the first lock. With a rise of just 3” at least they had an easy start. To be fair they had hired before, so knew what they were about. It started to rain while we were in the lock, so we pulled over not much further on, at the edge of Longacre Wood. There’s been a couple of interesting local stories in the papers this week. 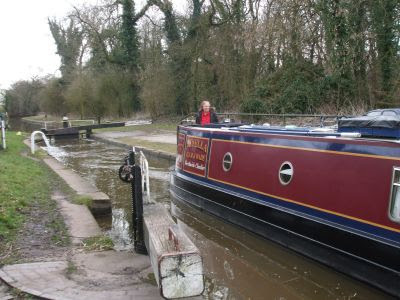 The Shropshire Star has a short article on the proposed extension of the Whitchurch Arm off the Llangollen Canal. 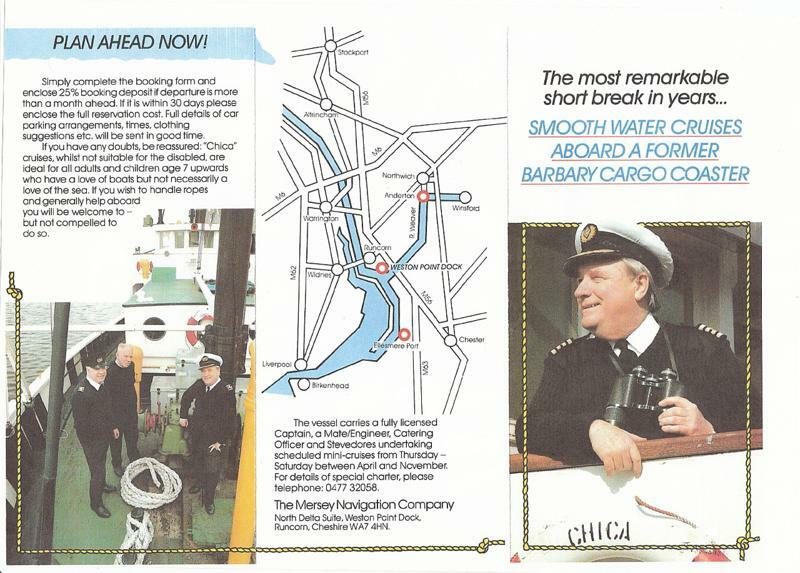 If this scheme came to fruition to town would benefit from the increase in (boaty) trade, much as Ellesmere does at present. We’re still up here on the canal, looking down on the River Weaver from near Bridge 210. The warm(ish) weather has got the old get up and go going, and I’m consciously looking for things to do. Yesterday I had a clear out in the roof box, making room for paint cans out of the engine room. We’re due our Boat Safety Certificate assessment this year, and I expect that storage of flammables close to the engine would be a definite no-no.I set up a smaller box, just for fenders, to make room. Today I’ve been making up new rear door liners. When we first got the boat the doors were just plain, painted blue. 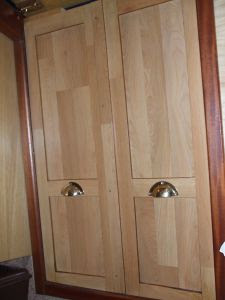 After I’d laid the laminate floor I’d got several lengths left over, so used them to trim the door panels. Looks OK, too. It was never intended to be a long-term solution, and damp has got into the bottom corners at the stern, causing them to swell alarmingly. So I’m experimenting making up panels in a traditional style. If they look all right I’ll do the same for the two side hatches. The weather is still pretty kind, just the odd drop of rain the last two nights. 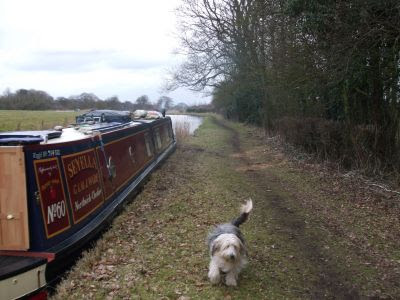 Meg and I have had several good walks, today heading back towards Northwich on the canal, over Saltersford Tunnel and returning along the river. 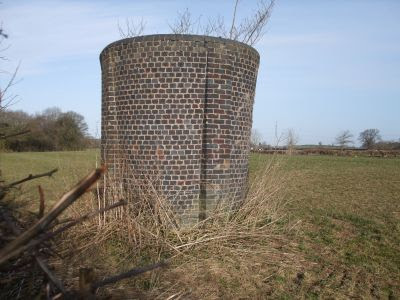 Ventilation Shaft above Saltersford Tunnel…. There’s no towpath through the tunnel; the horses were led over the top while the boats were “legged” through. Looking down on Saltersford lock The maintenance boat at the larger chamber is there for some work on a ground paddle sluice. 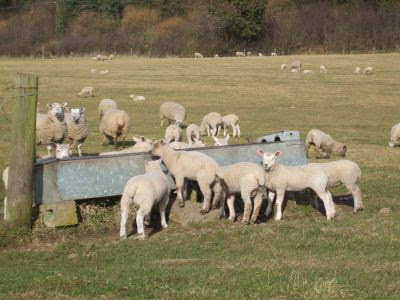 On the towpath side of the river the flood plain is used for grazing or crops. The canal is cut into the bank in the tree line 50 feet up on the right. 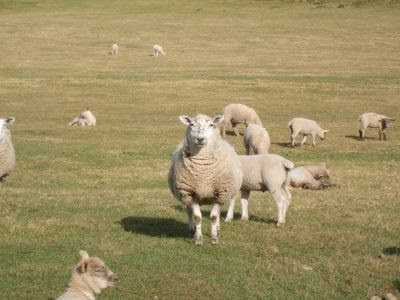 There’s one field full of ewes and lambs. 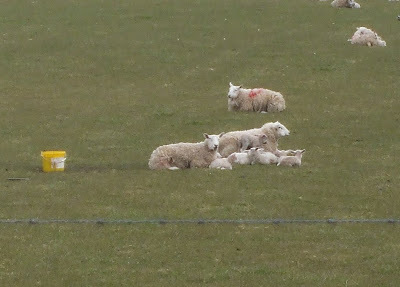 The mums didn’t seem very welcoming…..
but the little 'uns were just curious. 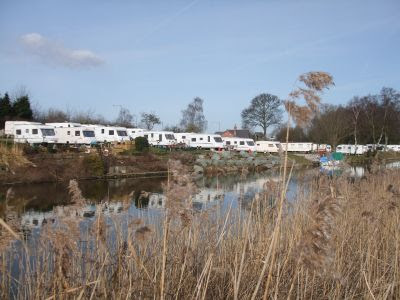 I wonder why caravans aren’t painted to blend in to the countryside, rather than stand out from it? 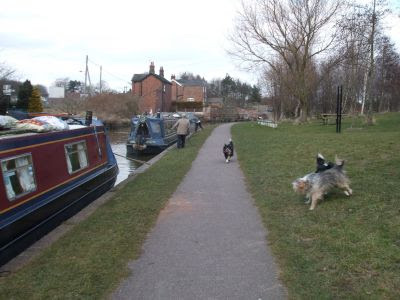 The walk along the river ends at Acton Bridge. Just 5 minutes back up the road and you’re on the canal again. Around 1¾ hours, nice and steady. Miles 0, Locks 0. But some good walks. Must be the best day yet…. Today has been superb, fine, sunny and warm. 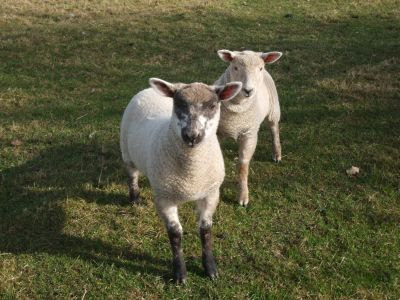 We’d better make the most of it though, we’re due wet and windy weather at the end of the week. We moved back to Anderton on Friday, to collect a car from Enterprise in Northwich. Opposite where we’d moored for the previous few days there were a few sheep dotted about. By the time we left, there’d been a population explosion! The car was needed for a visiting weekend. On Saturday up to Yorkshire to say hi and collect some heavy packages that it wasn’t sensible to forward. This included some bits for the stove, a pair of boots for me and a jacket for Mags. 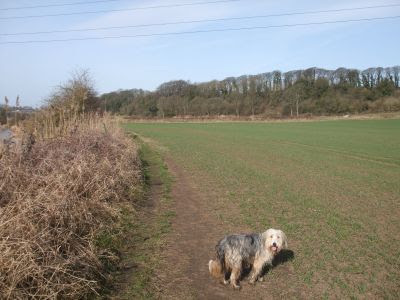 Then on Sunday we went in the opposite direction, down to Leicestershire to see my folks. We spent the day with them, and Kay and partner Paul came over for a visit as well. We got back to the boat in the evening, and I was glad of my bed that night. Nearly 400 miles driving taking 7½ hours took it’s toll. Not used to those mileages these days; the best we’d normally manage would be around 20! And a lot more relaxed 20 they’d be, as well. The weather has stayed fine, and today has been the best of the year so far. 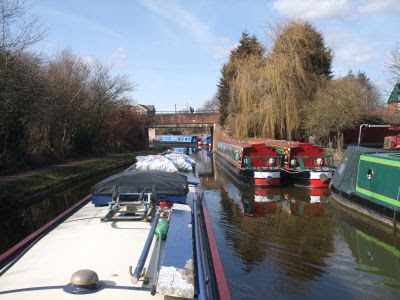 The bright sunshine shows off the colours of the boats at Anderton…. We moved out into the country again today, finishing up in one of our favourite spots above the Weaver, near Bridge 210. It’s been a bit of a stop-start trip. First was a visit to the services at Anderton, then into Uplands for diesel and solid fuel, and finally a pause at Barnton Bridge while I took a parcel up to the Post Office. (Mags’ new jacket didn’t fit…) So with about 100 gallons of water, 140 litres of diesel and 250Kg of smokeless we’re now about ¾ ton heavier than we were this time yesterday! That’s worth around an inch on the draught, more at the bow than the stern. One of the letters we picked up in Ingleton was my entry details for the Liverpool Half Marathon, on the 28th. For the first time in my running history I’m considering being a no-show. My injured leg does not appear to be improving, in fact I aborted a training run this morning. I’ll be gutted if I can’t compete, but I’ve another 3 races planned for the rest of the year and if I persist I might do damage that’ll prevent me running those. I’m going to take a week off, and see how I feel then. Unfortunately, even if I do run, I’ll not be looking for a fast time. Too much inconsistency in the most intensive period of my training schedule means I’m not as fit as I should be. No Problem and Seyella set off today, in different directions. 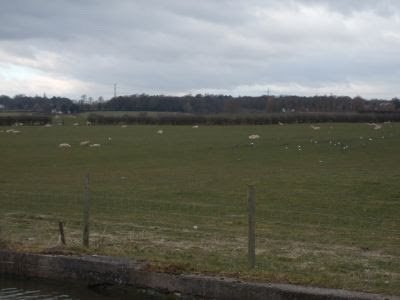 Sue and Vic are heading up to the Bridgewater and Leeds and Liverpool, we’re still in “potter about” mode so just headed down to moor near Marbury Wood. 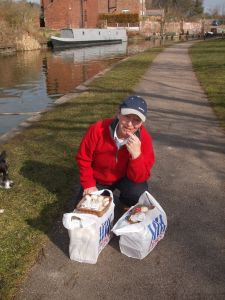 But before we set out, Sue had 5Kg of mushrooms to repatriate to Tescos…..
Not much-room in those bags --- groan! It was early afternoon before we moved out. Another fine dry day, but a bit cooler with some clouds knocking about. Still, can’t complain. We’ll maybe cross paths again in a few weeks time. What a fine few days we’ve had. 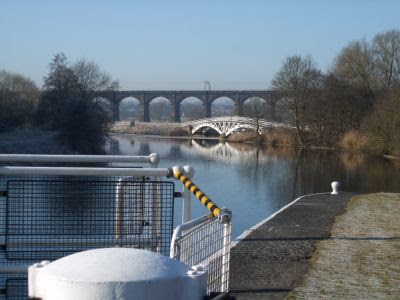 Although there’s been hard frosts overnight, leaving a skin of ice on the canal, the days have been sunny and warm. I’ve taken the opportunity to get some paintwork touched up, particularly around the back hatch where I’ve recently fitted new slides to the framework. Yesterday afternoon I was sat out on the bow, polishing brasses, in my shirtsleeves! And, of course, there's been long walks with Meg. The horse bridge over the weir stream, and the railway viaduct in the background. We decided we’d better head back towards civilisation today, so set off back to Anderton. A bit cooler today with a fresh breeze, but still mainly sunny. 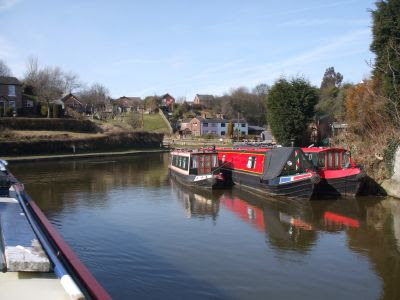 A short but enjoyable cruise above the Weaver valley, through the 2 tunnels and past the boat lift. We’d just pulled in on the visitor moorings when a boat appeared around the corner in front of us. That looks familiar…. 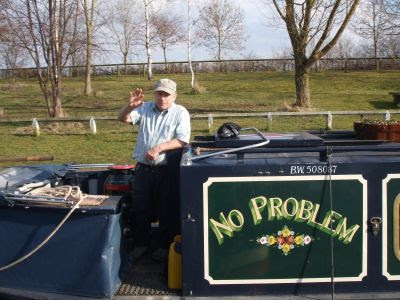 Sue and Vic on No Problem! 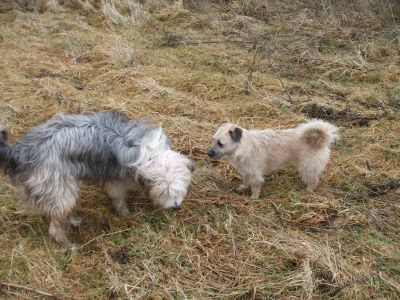 Their dogs, Meg and Lucy, jumped off and immediately got involved in a melee of barks and waggy tails from our Meg. The human greetings were a little more restrained…. but just as sincere. They pulled in in front of us, and we swapped news, then this evening Sue and I took the dogs for a ramble around the footpaths. We’re both just stopping here overnight, then going our separate ways again. Yesterday’s online Guardian carried an article regarding the proposal to move British Waterways into the “Third Sector”. This is apparently newspeak for charitable status, which would give the organisation more flexibility in sourcing funding. 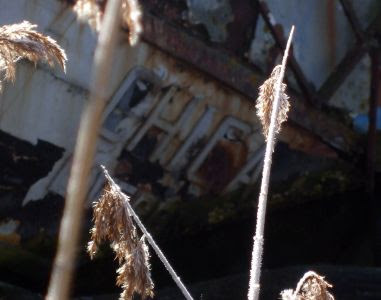 With central government grants falling, something needs to be done to ensure that the waterways we have don’t fall back into the decay of the 60’s. This is one alternative that could work, with managers in charge that have the right mindset. Not just doing a job, but doing it with passion. Sue on NB Cosy Toes commented on my last post. 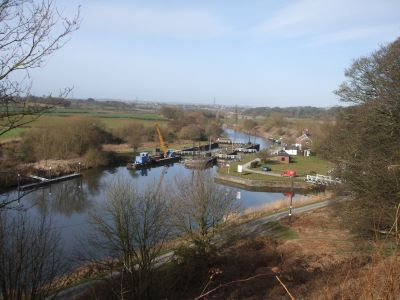 The winding hole at the end of the Runcorn Arm is after the pontoons, just before the bridge. Thanks, Sue. I didn’t go that far up. My fault. Sorry if I sounded a bit down-beat about the trip. I didn’t mean to. A useful tip about the BMBC club, which we may well take advantage of in the future. And Sue, you started well, how about updating the blog? Been there, done that, got the T shirt…..
A bit of poetic licence there, it was actually half a lined cotton jacket. 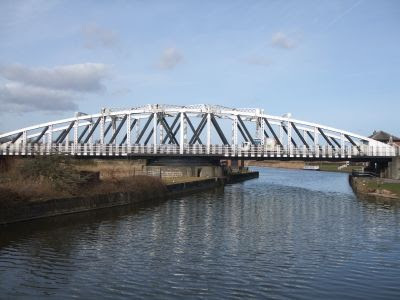 It’s 4½ miles from the junction to the end of the Runcorn Arm. Quite a pleasant run, there’s always a presence of the built up area on the left (south) bank, but often the opposite side is wooded. 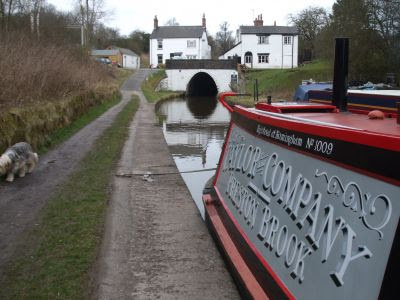 The character of the waterway is the same as the route through to Manchester, broad and deep, making good progress easy. 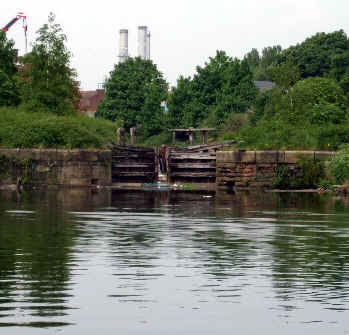 Of course this section was the original main line, ending with an impressive flight of 10 locks down to the River Mersey. There’s an archive picture here. 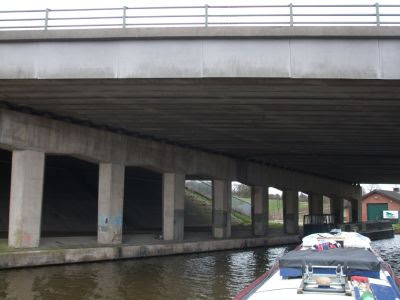 The new line is under the Runcorn-Widnes Bridge carrying the A533 over the Mersey. 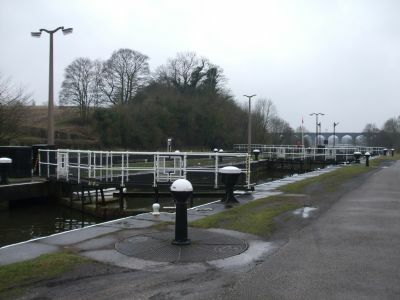 I took this picture of the entrance lock of the Runcorn and Weston Canal from the Weaver in May 2008. 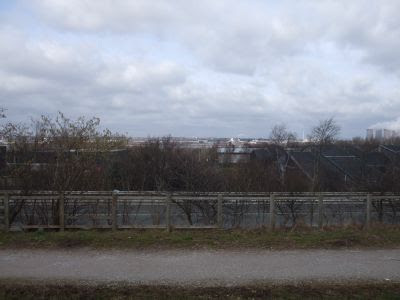 The canal winds around the hill heading north then east, parallel to the Manchester Ship Canal. We arrived at the terminus after around 90 minutes, and found that it was going to be extremely difficult to turn around. Boats moored chevron pattern on the left, and another directly opposite the widest bit, meant that I decided to reverse to the last broad stretch, about half a mile back. All was going well till we got through the first (last) bridge. It was there we picked up the debris, losing drive completely. I shut down the engine and spent a couple of minutes with my head in the hole, dragging the material off the prop. 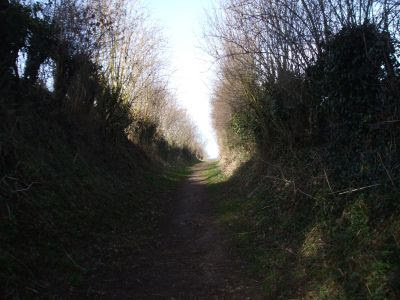 We’d drifted diagonally across the cut, bow to the towpath and stern in the weeds by the time I’d got it clear, watched in bemusement by a spotty youth leaning on his mountain bike. Anyway we finally got turned around, and followed our wake back out to Preston Brook. 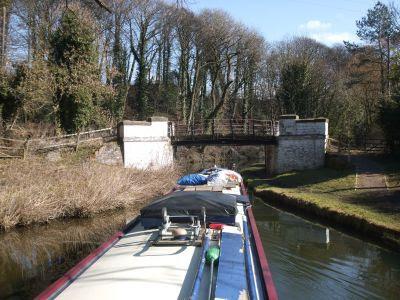 Getting to the T junction we turned right, past Claymoore once again and through Preston Brook Tunnel, finally mooring next to Long Acre Wood. Meg loves it here; it's full of squirrels! 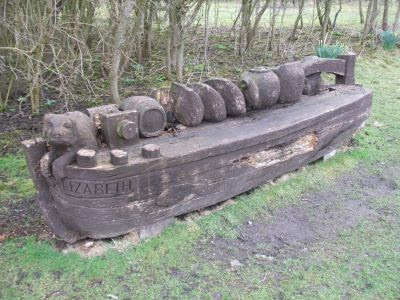 Moored at Longacre Wood. Watch out squirrels, here’s Meggy! 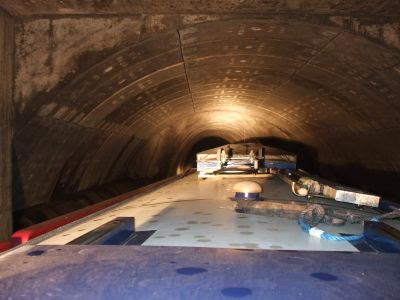 The 1239 yard long tunnel underwent major repairs some years back. A new section, made from pre cast concrete, was introduced in the middle. I can’t remember if I’ve posted pictures of the repair before. If I have, apologies for doing the same again. If not, well here you go…. 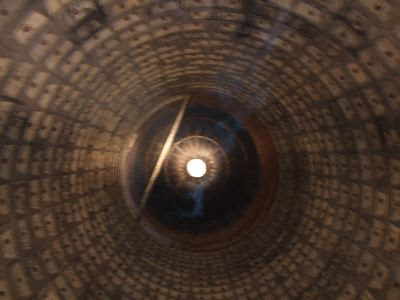 Looking up the new central air shaft. On a completely unrelated topic, where we moored last night is close to Daresbury, birthplace of Charles Ludwidge Dodgson, aka Lewis Carroll. 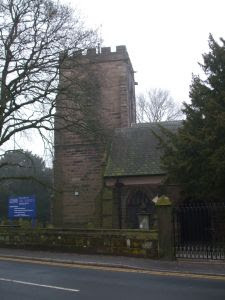 The Church of All Saints in the village has a commemorative stained glass window, depicting the man himself, his daughter Alice, and a selection of characters from Alice in Wonderland. 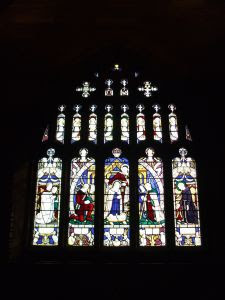 The Vicar, Rev Felix, was kind enough to fill me in on the details of the window, as well as the history of the church. Nice chap.